The following is from David Griffith of the Munrow Forum. 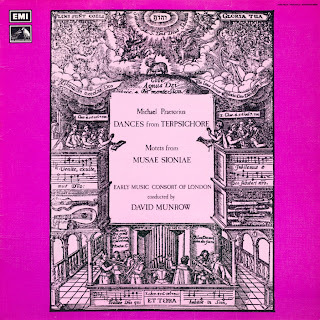 A search on David Munrow reveals a rich variety of programmes featuring Munrow, and helps to pinpoint his popularity and influence amongst the wider public, and not just the samll world of early music. When he died on 15 May last year David Munrow was only 33 years old, yet within the span of a decade he had widened the musical horizons of millions by his concerts, records, writings and broadcasts. Whether directing the EARLY MUSIC CONSORT OF LONDON or introducing Radio 3's Pied Piper, he radiated an intense enthusiasm which could leave his colleagues just as often exhausted as exhilarated. When he died in 1976. David Munrow was only 33 years old, yet within the span of a decade he had widened the musical horizons of millions by his concerts, records, writings and broadcasts. Whether directing the Early Music Consort of London or introducing Radio 3's Pied Piper he radiated an intense enthusiasm which could leave his colleagues just as often exhausted as exhilarated. Michael Oliver presents this award-winning portrait of a dynamic and sometimes controversial personality, with impressions and assessments from PROFESSOR WILLIS GRANT, BILL ODDIE , A. G. ELLIOTT-SMITH (former Principal of Markham College, Lima, Peru), MEREDITH DEWEY (former Dean of Pembroke College, Cambridge), CHRISTOPHER HOGWOOD , GUY WOOL-FENDEN, JAMES BOWMAN , JASPER PARROTT , JOHN WILLAN and PROFESSOR ROBERT DONINGTON. A celebration of the brilliant young musician and broadcaster who died last month at 33. With his group, the Early Music Consort, he revived, arranged, performed and popularised music from as far back as the Middle Ages which he played on the instruments of the time with astonishing virtuosity. In his later years Hector Berlioz suffers disappointment over his opera The Trojans, but finally marries his great inspiration, Harriet Smithson. 22.45 After Munrow A programme on the early music scene in Britain as it is now, and as it was before David Munrow 's death in 1976. Richard Langham Smith presents three programmes tracing orientalism in French opera. London's annual Spitalfields Festival last Thursday. The concert includes a first performance of Back to Ground by Martin Butler. The recital marks the 25th anniversary of the death of English early music exponent David Munrow , who is also the subject of the following programme. The Pied Piper. Featuring selections from Villa-Lobos's Bachianas Brasileiras and Choros, and recordings by David Munrow. With Jonathan Swain. This week's programmes include music from the Bachianas Brasileiras and Choros by Villa-Lobos, and recordings by early music pioneer David Munrow. Stephen Johnson presents the first of two programmes featuring BBC archive recordings by the early music pioneer and broadcaster David Munrow. Today he reflects on Munrow as virtuoso recorder player, with performances of music by Handel and Telemann. There are also extracts of a studio portrait of Munrow's Early Music Consort in its first year. Music Consort with excerpts from a studio portrait of the group in its first year. Stephen Johnson presents the second of two programmes featuring BBC archive recordings by the early-music pioneer and broadcaster David Munrow , who died 25 years ago at the age of 33. Today a look at Munrow's spare-time job as a radio presenter, and at his influence on contemporary composers. The programme also features recordings of music by Dufay and Bach. The hunting bow was the ancestor of an astonishing variety of instruments. 23.10 Ancestral Voices The hunting bow had its own magical sound. The ' twang ' of the string as it despatched the arrow was feared and respected. Man experimented with it and it became the parent of an astonishing variety of instruments. When men started to grow crops, they praised their fertility god on an instrument which evolved from a simple corn stalk. The hunting bow had its own magical sound. Man experimented with it and it became the parent of a variety of instruments. Against the grim setting of a Saxon court a young prince woos his lovely child-bride. Their romance, distasteful alike to the Church and to certain courtiers, leads them relentlessly towards a tragic fate. Music from the Renaissance and Reformation has become some thing of a cult, and has already been absorbed into the ' POP' scene.DAVID MUNROW introduces music from as early as the reign of Henry II through to the period of Elizabeth I , ranging in style from the elegant and courtly to the bawdy and scandalous. He also conducts viewers round this National Trust property, which has strong connections with James I and the Gunpowder Plot. The flute has age-old magical associations. Aztec slaves played it before being sacrificed; in Africa it brought rain and was a giver of life. Around the year 1200, as the , frreat cathedral rose from the banks of the Seine, Paris became the centre of the so-called 12th-century Renaissance. The arts flourished, and for the first time in history we can identify the names of two composers who helped establish the course of music for four centuries:. Leonin and Perotin.